Dengue and yellow fever are both caused by flaviviruses, and each is spread by an arthropod vector. 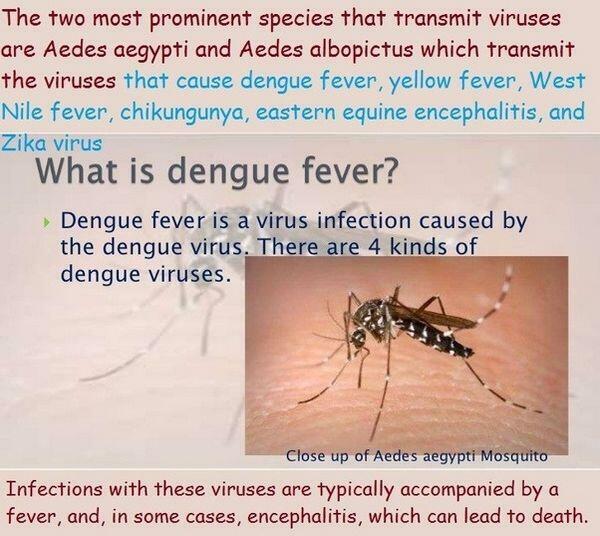 The etiologic agents of dengue are the dengue virus types 1-4, whereas yellow fever is caused by the yellow fever virus. Flaviviruses produce a wide range of diseases including hemorrhagic fevers, arthritis, encephalitis, and hepatitis. Hepatitis C is caused by a flavivirus and is discussed in site. Until recently the flaviviruses were included in the Togaviridae family, but differences in size, morphology, gene sequence, and replication strategy have made it necessary to classify them as an independent virus family. The flaviviruses are also classified as arboviruses (see site) because they are usually spread by arthropod vectors and as zoonotic viruses because they are spread by animals. These viruses have a very broad host range, including vertebrates (eg, mammals, birds, amphibians, and reptiles) and invertebrates (eg, mosquitoes and ticks). A cycle of infection occurs in which the virus is transmitted by the arthropod vector and amplified in a susceptible host to allow reinfection of other arthropods. Humans are usually dead-end hosts that cannot spread the virus back to the vector because a persistent viremia is not maintained. These viruses are maintained by Aedes spp. mosquitoes in a sylvatic or jungle cycle, in which monkeys are the natural host, and also in an urban cycle, in which humans are the host. A aegypti is a vector for each of these viruses and is a household mosquito. It breeds in pools of water, open sewers, and other accumulations of water in cities. Dengue occurs throughout the world, with long-known endemic areas in tropical Asia, Polynesia, Micronesia, and East and West Africa. In recent years there has been an upsurge of dengue in South and Central America, the Caribbean, and India, and the spread is predominantly human-mosquito-human, with persistent viremia in the human allowing infection of mosquitoes. Yellow fever is also found in the Caribbean and the tropics, including Africa but not Asia, and the spread is monkey to mosquito (A aegypti) to monkey or to human. In the past decade there has been a major increase in cases especially in Africa. Dengue is the most prevalent flavivirus and causes = 100 million infections/year. In the past, dengue occurred in outbreaks within the United States, and the presence of A aegypti and A albopictus, another potential vector, in the coastal southern United States means that future outbreaks could occur. The flaviviruses are spherical (40-60 nm) enveloped, positive, single-stranded ribonucleic acid (RNA) viruses. They attach to specific receptors expressed on many different cell types from many different species. Flaviviruses can also attach to the Fc receptors on macrophages, monocytes, and other cells when they are coated with antibody. The antibody actually enhances the infectivity of these viruses by providing new receptors for the virus and by promoting its uptake into these target cells. The virus enters the cell by receptor-mediated endocytosis. The envelope fuses with the membrane of the endosome on acidification of the vesicle to deliver the capsid and genome into the cytoplasm. Once released into the cytoplasm, the flavivirus genomes are translated via complementary RNA into several proteins. Assembly and budding of flaviviruses occur predominantly in the cytoplasm by using intracellular membranes or vesicles, rather than at the cell surface. Virus release occurs during lysis of the cell. The flavivirus can cause lytic or persistent infections of both vertebrate and invertebrate hosts. Infections of invertebrates are usually persistent, with continued virus production and no damage to the insect. Female mosquitoes acquire the flaviviruses on taking a blood meal from a viremic, vertebrate host. The virus infects the epithelial cells of the mid-gut of the mosquito, spreads through the basal lamina of the mid-gut to the circulation, and then infects the salivary glands. The virus sets up a persistent infection and replicates to high titers in these cells. The salivary glands can then release virus into the saliva. After biting a host, the female mosquito regurgitates virus-containing saliva into the victim's bloodstream. The virus circulates transiently in the plasma, and primary replication occurs in lymph nodes. The initial viremia, after replication of the virus in these tissues, produces systemic symptoms such as fever, chills, headaches, backaches, and flulike symptoms within 3-7 days of infection. Some of these symptoms can be attributed to the interferon produced after infection of these target cells. Most yellow fever infections do not progress beyond this point, but secondary multiplication of virus occurs in liver, spleen, kidneys, heart, and bone marrow with severe toxicity. Both humoral and cellular immunities are elicited and are important to the control of primary infection and prevention of future infections with the flaviviruses. Unlike viruses that initially replicate in the lung, intestine, or viscera, the primary infection by these viruses is in lymph nodes. This presents the virus immediately to macrophages, the reticuloendothelial system, and the immune response. Replication of the flaviviruses in the macrophage and endothelial cells produces a double-stranded RNA replicative intermediate that is a good inducer of interferon. The interferon produced soon after infection is released into the bloodstream to limit further replication of virus and stimulate the immune response. The interferon also causes the rapid onset of flulike symptoms characteristic of mild systemic disease. Circulating immunoglobulin M (IgM) is produced within 6 days of infection, followed by IgG. The antibody blocks the viremic spread of the virus and subsequent infection of other tissues. Immunity to one flavivirus can protect against other flaviviruses by recognition of the common antigens expressed on all members of the viral family. One example of this may be occurring in the Far East, where Japanese encephalitis but not yellow fever virus is endemic despite the presence of the A aegypti mosquito vector for yellow fever. Cell-mediated immunity is also important in control of the primary infection. Natural killer cells, T-cells, and macrophages are activated by interferon and can respond to the cell surface antigens displayed on the infected cells. Immunity to these viruses is a double-edged sword. Inflammation resulting from the cell-mediated immune response can destroy tissue. Prior immunity can promote hypersensitivity reactions such as delayed-type hypersensitivity, formation of immune complexes with virions and viral antigens, and activation of complement. A non-neutralizing antibody can also enhance uptake of the flaviviruses into macrophages and other cells that express Fc receptors. Such an antibody can be generated to a related strain of virus in which the neutralizing epitope is not expressed or different. The consequences of such partial immunity can be devastating. For example, prior infection by one strain of dengue virus will predispose an individual to dengue hemorrhagic fever (DHF) when infected by another strain of dengue. The weakening and rupture of the vasculature are believed to result from activation of complement and other hypersensitivity reactions. In 1981 an epidemic of dengue-2 virus in Cuba infected a population previously exposed to dengue-1 (between 1977 and 1980). More than 100,000 cases of DHF-dengue shock syndrome (DHF/DSS) resulted, with 168 deaths. 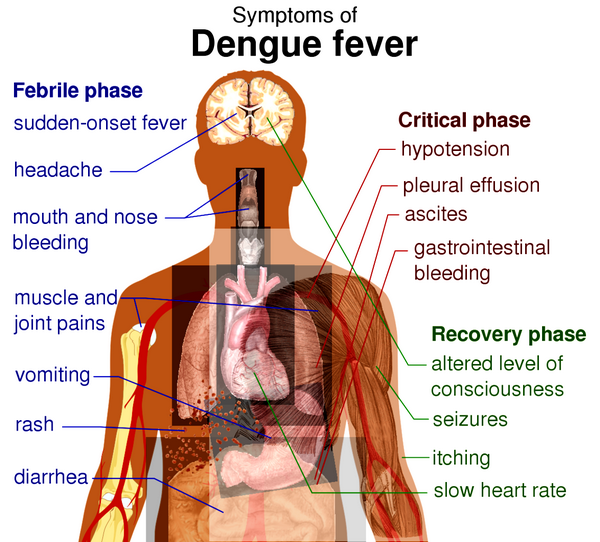 Dengue: After an incubation period of 5-6 days, dengue infection may be asymptomatic or associated with a nonspecific illness or with classical dengue. The latter consists of fever, erythematous rash, and severe myalgias involving the back, head, muscles, and joints. The severity of the myalgia is reflected in the alternative name "breakbone fever." After 1-2 days of fever and rash, the patient's high temperature returns to normal, only to recur 3-4 days later. The recurrence of fever is followed by a second rash that involves face, trunk and limbs but not palms or soles. The fever abates as the second rash develops. Between the two febrile periods the patient remains symptomatic with gastrointestinal or respiratory symptoms or both. Generalized lymphadenopathy is often present. Resolution occurs in the second week, and fatalities are very rare. On rechallenge with a related strain, dengue can cause severe hemorrhagic disease and shock (DHF/DSS), which occur in tens to hundreds of thousands of cases per year. The hemorrhagic-shock symptoms are attributed to rupture of the vasculature, internal bleeding, and loss of plasma. In addition there is high fever, nausea or vomiting, ecchymosis, and edema of the hands and face. Yellow fever: The incubation period of yellow fever is 3-6 days. 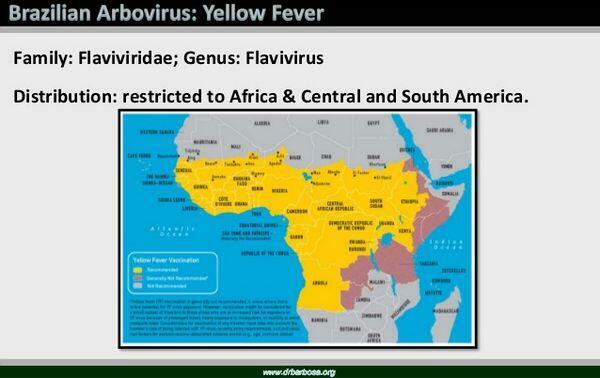 Most infections with yellow fever virus are subclinical or anicteric. Icteric yellow fever infections are characterized by severe systemic disease, with failure of the liver, kidney, and heart and hemorrhage of blood vessels. Liver involvement leads to the jaundice from which the disease obtains its name, but massive gastrointestinal hemorrhages (so-called "black vomit") may also occur. The principal means of diagnosis is antibody assay, and a variety of serologic methods can be used to diagnose infections. A fourfold increase in titer or seroconversion between acute and convalescent sera is used to indicate a recent infection. The serologic cross-reactivity between viruses in a group or complex limits identification of the actual viral species in many cases. IgM and complement fixing (CF) antibodies are short-lived (1-2 months) and can be useful in documenting acute infection. Demonstrations of viral antigen or viral RNA (by polymerase chain reaction [PCR] assay) in blood or tissue can also prove the diagnosis. Leukopenia is typical; thrombocytopenia is especially prominent in DHF and yellow fever. Abnormal clotting parameters occur in both, as do increases in liver enzymes. Jaundice occurs in yellow fever, not dengue. Rising creatinine may occur in both diseases. Flaviviruses can be grown in both vertebrate and mosquito cell lines but are difficult and dangerous to isolate. In addition to cytopathology, the viruses grown in culture can be detected by immunofluorescence or by hemadsorption of avian erythrocytes. After isolation the viruses can be distinguished by RNA analysis or immunoassays. No treatment exists for flavivirus diseases other than supportive care. The fatality rate from DHF is up to 15% as a result of multiple organ failures. The mortality rate from yellow fever is approximately 10% and also results from multiple organ failures (liver, kidney, and heart). The easiest means to prevent the spread of flaviviruses is elimination of its vector and breeding grounds. After the discovery by Walter Reed and colleagues that yellow fever was spread by Aedes aegypti, the number of cases was reduced by controlling the mosquito population. Vaccination provides effective protection. A live vaccine (17D) is available against yellow fever virus, for individuals working with the virus or at risk for contact. International travelers to yellow fever-endemic zones should be immunized. The yellow fever vaccine is attenuated from the 17D strain isolated from a patient in 1927 and passaged extensively in monkeys, mosquitoes, embryonic tissue culture, and embryonated eggs. The vaccine elicits lifelong immunity to yellow fever and possibly other cross-reacting flaviviruses. Vaccines against dengue virus are also being developed.